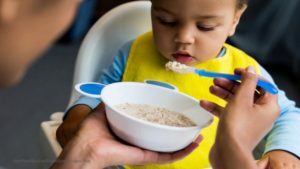 According to a study by scientists at Dartmouth College, some baby formula and cereal bars sweetened with organic brown rice syrup exceed U.S. government standards for arsenic in bottled water. That standard is set at 10 parts per billion (ppb). There are currently no United States laws regulating arsenic content in food. The Dartmouth study, published in the journal Environmental Health Perspectives, sampled 17 baby formulas, 29 cereal bars and three energy shot drinks, all purchased in New Hampshire. The brands were not named. The researchers found that the one of the two formulas that used organic brown rice syrup as a sweetener had arsenic levels at six times the federal limit for bottled water. Brown rice syrup is used in some products instead of other sweeteners such as high fructose corn syrup. An analysis by Consumer Reports about arsenic in fruit juices last year raised concerns among consumer groups and some lawmakers. That study found that 10% of the juices sampled, from five brands, had arsenic levels higher than the drinking water standard. Consumer Report’s findings prompted Congressman Frank Pallone (D-NJ) and Congresswoman Rose DeLauro (D-CT) to introduce a bill to protect children from arsenic and lead in fruit juices. The USDA has stated that it knows arsenic is present in foods, and has recently conducted a study studying that compound in rice that is expected to be completed this year. Babies and children are especially vulnerable to arsenic because of their small size and their rapid rate of growth. And high arsenic levels can affect brain and nervous system development. Rice is a major source of inorganic arsenic because much of it is grown in former cotton fields, and the rice plant is very efficient at absorbing arsenic from the soil and water as it grows. Arsenic-based pesticides were heavily used on cotton crops in the southern United States in the last century until they were banned in the 1980s. In fact, rice grown in former cotton fields contains almost twice the amount of arsenic as rice grown in California. Unfortunately, even organically-grown rice can contain arsenic. In order for foods to be certified organic, the farms where they are grown must be free of pesticide use for three years. But arsenic can remain in the soil for decades. Unless you eat a lot of cereal bars containing rice syrup, there’s no need to worry about that product, which has arsenic levels of 23 to 128 ppb. But the arsenic levels in baby formula are a cause for concern. The scientists at Dartmouth who conducted the study said there is an “urgent need” to regulate arsenic levels in food. Nature’s One® continues to pursue its mission to make organic better. Today the company confirms its new organic-compliant filtration technology reduces organic and inorganic arsenic found in brown rice syrup to undetectable levels of less than 4 parts-per-billion. Nature’s One was founded on the principle of ensuring its products are formulated with the purest ingredients possible. Its advanced filtering process establishes the highest purity standard for rice used in organic infant foods and formulas. This new industry standard is well below the EPA’s drinking water regulation for arsenic. If you have additional questions, you’re welcome to contact us here at Nature’s One! If you read labels on any baby formula you buy, they must list brown rice or brown rice syrup as an ingredient. If you’re concerned about this issue, don’t buy those products. You can also call the company that makes the baby formula you feed your child and ask them for more details on the ingredients they use. And I agree; we should know the names of the brands that use rice. There is something you can do about this issue. Sign the petition asking the FDA to limit the levels of lead and arsenic in fruit juices. There is currently no law in this country limiting arsenic levels in food. You can also read through Web MD’s article about arsenic in food to learn more about it. What should moms who have used this baby formula do besides obviously stopping it? Is there a test the baby should take? Is there anything that can be done to reverse the potential negative effects already caused? Nobody is addressing the panic that this study has created with these moms. I understand your concern, but don’t panic. If you are worried, please talk to your doctor or health care provider about this issue. There are tests to check arsenic levels in the body, but you and your doctor need to decide if those tests are even worth considering. For now, don’t feed your child any more of the formula that contains brown rice syrup; read labels carefully. There’s more information about arsenic in foods and what to do about it at WebMD.